When nails and screws are impractical, builders turn to adhesives for all types of permanent installation work. Mixing wooly asbestos fibers into natural and synthetic glues results in durable, nearly fireproof adhesives, sealants and joint-fillers. Though people once saw these products as safe and reliable construction materials, the toxic asbestos fibers in them have proven to be a major health hazard. Heavy-duty adhesives are often referred to as “construction mastics,” which may take the form of paste applied from a caulking gun or powder that is mixed and applied like cement. Asbestos has been used in liquid construction mastics, conventional lime-type cements and synthetic plastic cements, and it has also been a primary ingredient in gunning mixes, a type of spray-applied powdered adhesive that is mixed with water as it is applied. 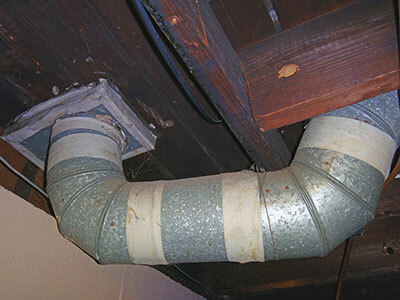 Though asbestos adhesives have not been manufactured in the U.S. for many years, they can still be uncovered in many parts of old buildings today. Wallpaper and wall panels were commonly installed using asbestos adhesives. 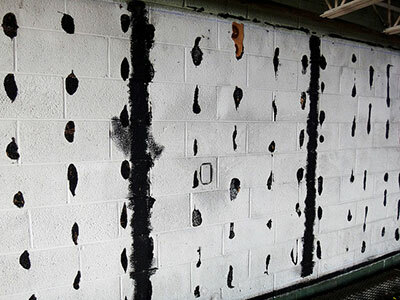 When wall panels are removed, the adhesive left behind is often visible as brittle old daubs. 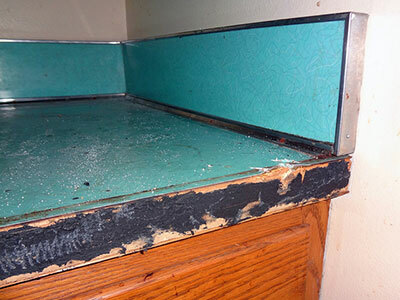 Asbestos adhesives were used in the finishes of countertops, cabinetry and other fixtures. 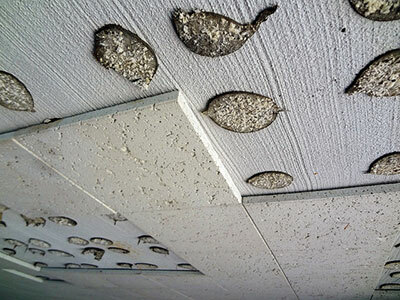 Ceiling tiles were often glued in place using asbestos-based glue pods, which can become brittle over time and release many toxic asbestos fibers into the air when disturbed. 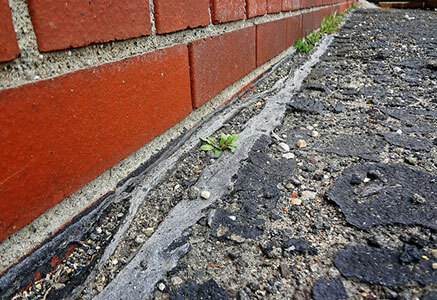 Asbestos was a common ingredient in plastic cements and sealants for rooftops. Over time, weathering exposes the white asbestos fibers in asbestos-containing sealant, causing it to turn from black to grey. Even duct tape commonly contained asbestos fibers before their toxicity was widely known. 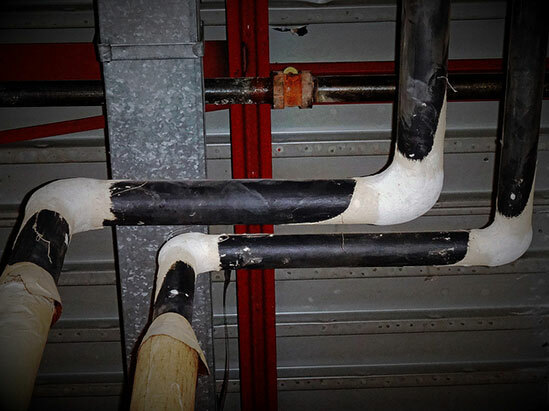 “Lagging” is a way of sealing and insulating pipes with strips of cloth soaked in adhesive, and asbestos-containing materials were once standard for this purpose. Special cement adhesives, often called “furnace cement,” are required for installing and repairing machinery that operates at high temperatures. Asbestos was a primary ingredient in fireproof cements and joint compounds, especially in industrial facilities and ships. The use of asbestos adhesives in the U.S. spans almost a century, with one of the earliest examples dating back to 1887, when the precursor of the Johns Manville Corporation began manufacturing fibrous adhesive cement that contained 20 percent asbestos. In 1906, the Philip Carey Manufacturing Company began selling an asbestos-based fibrous adhesive for more general construction use, and numerous other firms entered the market in the following decades as asbestos made its way into almost all aspects of building construction. Many asbestos adhesives were produced by first dumping raw asbestos into a fluffing machine to separate the mineral fibers before they were combined with resins or solvents in a batch-mixing tank. This industrial process exposed adhesive factory workers to clouds of inhalable asbestos dust, and spray-applied asbestos adhesives further endangered the health of the construction workers who applied them. In the early 1900s, physicians were already documenting the health consequences of asbestos exposure, and many life insurance companies stopped selling policies to asbestos workers. The owners of adhesive manufacturing companies knew of the risks of working with asbestos but chose to continue using the lucrative mineral, even after less toxic substitutes were identified. World War II multiplied the demand for asbestos adhesives, especially in newly constructed Navy ships where fireproofing of all kinds was imperative. The U.S. military remained a top consumer of asbestos adhesives long into the Cold War, while civilian use also expanded. In the 1950s, the National Gypsum Company added asbestos-containing adhesives and joint compounds to its popular Gold Bond line of construction products, and they went on to become standard materials used throughout the American construction industry. 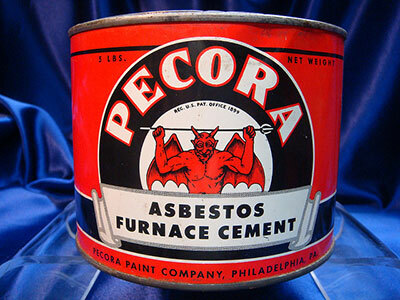 By the mid-1980s, almost 10 million gallons of asbestos adhesives, sealants and coatings were being produced. The rising tide of lawsuits over asbestos-related diseases, however, finally compelled most manufacturers to stop adding asbestos to adhesive products. The following are several brands of adhesive manufactured with asbestos. The adhesives used in numerous homes, businesses, and public buildings constructed before 1980 often contain between 1 and 25 percent asbestos, depending on the purpose of the adhesive. These asbestos products can become hazardous as the adhesives become brittle and break down over time, potentially releasing asbestos fibers into the air. Asbestos-containing seals may wear down, flake or peel away. By their nature, adhesives are difficult to remove once they have set, which means renovation or demolition work on floor tiles, wall panels or anything else glued in place can create large amounts of dust and debris as the dried adhesive is chipped or scraped away. If these adhesives contain asbestos, the dust and debris can create a serious exposure risk for everyone in the area. Asbestos cement adhesives, often used to repair boilers on ships, put many Navy veterans at risk in addition to civilian construction workers. Many of these cement adhesives came in powdered form, creating dusty conditions when they were mixed by hand before being applied. Microscopic asbestos mineral fibers have no taste or scent and can easily slip through a common dust mask, lodging in the lining of the lungs or the abdomen and causing cellular damage over time. Asbestos-related diseases such as asbestosis and mesothelioma generally take 20–50 years to develop after exposure. While most companies now use alternatives to asbestos adhesives, their use is not banned in the U.S. The only types of adhesive banned by the U.S. Environmental Protection Agency are spray-on adhesives containing more than 1 percent asbestos and asbestos flooring felt adhesive. Thousands of workers harmed by asbestos exposure have filed lawsuits against asbestos adhesive manufacturers to seek compensation for their medical costs and suffering. In the 1990s, for example, two engineers filed lawsuits against North American Refractory Company (NARCO). Frederick Moss had worked for Alabama Power Company from 1946 to 1988, and Martin Easter had worked for U.S. Steel from 1941 to 1970. Both had been exposed to high levels of asbestos dust while using NARCO gunning mix products, and they had never been advised to wear protective gear. As a result of the asbestos exposure, Moss and Easter developed mesothelioma. The jury found NARCO liable and awarded $7 million to Moss, Easter and a third plaintiff who suffered from asbestosis. Later in 2006, U.S. Navy veteran Joseph Garza filed a lawsuit against Asbestos Corporation Ltd., after he developed asbestosis. He had used the company’s asbestos adhesive cement to repair boilers on the USS Randall and the USS Agerholm for nearly 10 years. Because the company did not issue any warnings over the asbestos in its product, Garza had never taken any precautions against breathing in the dust or getting it on his clothes and hair. A jury in San Francisco ultimately awarded him and his wife more than $11.5 million after finding the corporation had acted with malice in not revealing the health risks associated with asbestos exposure. Many companies in the asbestos industry have established trust funds as part of bankruptcy reorganization plans. These trusts exist to settle present and future personal injury claims resulting from asbestos exposure. For instance, NARCO emerged from bankruptcy in 2008 by funding the North American Refractories Company Asbestos Personal Injury Settlement Trust with $6.32 billion. As another example, the National Gypsum Bodily Injury Trust has paid more than $429 million in claims since 2004, including to victims exposed through Gold Bond adhesive products. Black construction adhesives in buildings constructed before 1980 should always be tested for asbestos. Sanding, scraping or grinding these adhesives can release toxic asbestos dust into the air, endangering everyone in the building. 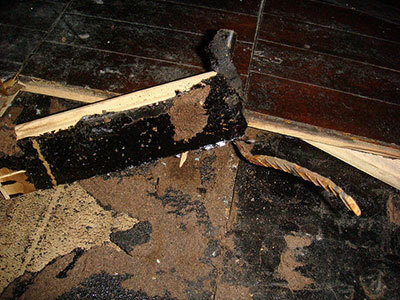 Some asbestos adhesives can be removed using chemical solvents, but these chemicals are not compatible with all types of adhesives, and they can damage or stain the subfloor. Check with the manufacturer about using chemical solvents. Asbestos adhesive removal is best left to qualified asbestos abatement professionals, especially when old asbestos glue daubs have become friable (easily crumbled by hand). Asbestos dust can be minimized by wetting the adhesive material and then scraping it by hand, but even then, the professional must be wearing protective gear and a HEPA mask to stay safe from asbestos exposure. Garza v. Asbestos Corp., Ltd. (2008). ICF Incorporated. (1989). Regulatory impact analysis of controls on asbestos and asbestos products: Non-roofing adhesives, sealants, and coatings. Society of Cleaning and Restoration Technicians. (2011). The commercial flooring report. Minnesota Department of Health. (2012). Asbestos Floor tile removal. Retropaper. (2012). Pecora Paint Company, Inc.
Crosby, J. H. (1990). What Every New Lawyer Needs to Know and have to Work in Asbestos Litigation. Trust Services, Inc. (n.d.). NGC Bodily Injury Trust. OSHA. (n.d.). Asbestos - Construction. North American Refractory Company v. Easter. (1999, March 11). BSA Educational Services Committee. (1991). History of adhesives.